If you're a web developer building sophisticated, user-friendly applications, you should be using Prototype. This reference gives you everything you need to use Prototype to its fullest. 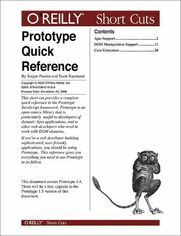 This document covers Prototype 1.4. There will be a free upgrade to the Prototype 1.5 version of this document.